talk to your neighbors, explain what you do, show them even. Looks like Russian HFCS anvil not a terrible anvil mp but not great , have fun learn hammer control on it. Use a thin walled piece a black pipe with one end closed place it in the forge, build you a fire let burn down adding a lite air to forge when needed, put a couple pieces of small charcoal inside pipe tp help keep the scale down on the blade, this how I do it with my big bowies and daggers. Thank you all. 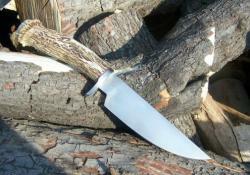 I wanted something can do more then one chore., and not a pointy knife to make a mess when it come to skinning. Finished the case for this knife , sharpen and a 14 year boy first custom knife and case for xmas. Tree Fell on his car Drop point. Wow that looks great nice work. Take the center out and use the outside strands, Or make a bundle of the outside strands of cable. I like the shape of the blade alot, should be a great belt knife. I make blades out of beaing races, I forge mine alittle above non magnetic, You well have to be able to control your fire and watch your heat over cook the steel it well crubble to cold and you just bounceing your hammer or the steel it a frustrating steel to learn on . The race might be 52100, 8620, or case harded steel. Cut a piece of draw it out like bar a of steel about thick as a knife, quench in warm oil , let cool then brake it and see what the grain look likes. make sure with wear all the safety gear. Also is you want to make the the etch alittle better you can use cold blue and then buff it with 2000 wet dry paper. For oil you can use 3 in 1 oil. Wd 40 both work good. When I etch my wrought iron guard, I polish them to 350 grit , then Fill the tang hole with propoxy and let it set in white vinger i let it set and clean it with hot water ever often to check to how much is etched. When i have the wrought iron etched where I want , I clean it with hot water and four 0 steel wool Then i oil the guard and let it dry then I put a good coat of past wax on the metal and work it in. then set it aside for a night. Nice work Justin and the hamon looks great. Very nice,. do I see a hamon on the blade?